Check out new products that use el wire. You can also check out our reviews for certain el wire products. El Wire components help make the full el wire solution work perfectly. Check out our information to help you in your project. Check out new clothing designs as well as ideas to make your own el wire products. El Wire is one of the most fascinating lighting inventions of the past century. It is also known as electroluminescent wire, neon wire, glow wire and cool neon. It is a technology that generates no heat and can be easily used to provide bright, vivid light on any surface. It was invented in 1936, by a Frenchman Georges Destriau and has been growing in popularity ever since. The main function of the wire is creating neon-like light however; people in our era are coming up with new and exciting ways of capitalizing its distinctive properties. The material used is available in sheet and wire form, both are equally suitable for consumer use. The first El product ever designed was made of thick, inflexible and fragile glass or ceramic materials. Glass and ceramics as we know are not bendable; they cannot be stretched, wrapped, coiled or molded into interesting shapes. This limited the options for making El Wire useful. 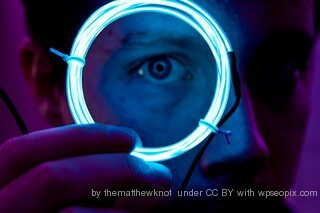 The next El Wire innovation came in the form of casting the wire with a protective and flexible plastic. This made it the wire flexible and waterproof, and safer for both indoor and outdoor use. One of the biggest properties the El Wire holds is its safety. It can be used for many purposes, for example costumes, stage performances, safety lighting, toys, emergency lighting, and clothing. The core reason behind the rapid popularity of this product is its adaptability and efficiency. It is used for costumes at festivals, on various frames or structures, to do different tricks at circuses and carnivals. It possesses vivacious strands of wires joined together give a positive and beautiful feel. Artists like Marcus Tremento use different colored lights with the help of El Wire to portray modern art and design. El Wire is also used as safety indications at offices and malls because when the power is out it illuminates the accidental areas. It can also be used to help people find their way out of malls or offices in case of an emergency. Moreover, El Wire is great for holidays. It can be used on Christmas adding striking and new colors making surrounds bright and beautiful to lighten up everyone`s mood. It can also be used to fashion cool and unique holiday costumes. This amazing multipurpose El Wire basically consists of two sets of thin copper wire which are coated in phosphor. The wires are then covered by a layer of protective plastic creating a glow when voltage is applied across it. The wire is thin in diameter, which makes it bendable and ideal for use. It has a variety of thickness categories from 1.2 mm to 5 mm. There are many colors of El Wire available even though the phosphor emits a specific color. The plastic protective layer further filters the final color allowing the wire to be available in around 11 colors. Every color wire has the same material inside but the white color now uses a special pinkish phosphor with aqua coating producing a brighter white. To make the El Wire glow a certain range of voltage is used which usually ranges between 100 and 200 AC volts applied. Also, it could simply be wired directly to the 120 VAC, 60 Hz line power but the overall light transmitted in terms of brightness all comes down to the frequency of the power. An inverter is used that converts DC power to a high frequency AC output. These inexpensive and readily available inverters are small enough that they can be used anywhere even on costumes. The DC input power is 6 to 12 volts; that can come from any battery. Importantly, the AC voltage is applied between the inner and outer wires, but not between the ends of the wire. El Wire technology is an environmentally friendly technology; it is made up of copper, phosphors and recyclable plastic which are in abundance around the globe. It is not just the greenest light technology; it is also the most efficient. Designers are using this in their new set of clothing lines, because it is just so much fun to wear. We’ve seen people wearing and showing off their El Wire costumes on the red carpet. Interestingly, celebrities like Chris Brown, MIA, Daft Punk and more have been seen using this wire as a part of their on-stage attire. 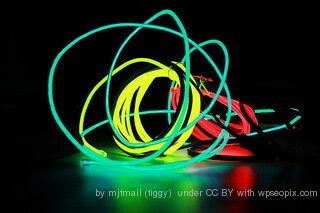 As more and more people discover the El Wire, more ways will be introduced to use it. It all comes down to your creativity: how, when and where will you decide to use these great El Wire ideas.